With its innovative trigger design and its bright, colorful display screen, the SMOK Mag 225W and TFV12 Prince Full Kit is an exquisite piece of vaping hardware. Equipped with tons of exciting features and available in a wide range of colors, this kit won’t disappoint. If you’re looking for a kit that boasts impressive technology and a comfortable grip, the SMOK Mag 225W and TFV12 Prince Full Kit is going to change your vaping life as you know it. The trigger-like shape of this device is both visually stunning and extremely efficient. The grip is designed for long vaping sessions. The SMOK Mag 225W comes in an enormous variety of colors and patterns. An enormous OLED display screen allows you to explore different settings and monitor your preferences with ease. For the TFV12 Prince, it’s renowned for improving flavor as well as vapor production. This tank comes with two different types of glass. The standard glass gives the tank a capacity of five milliliters of vape juice. The convex glass increases the tank’s capacity to 8 milliliters. 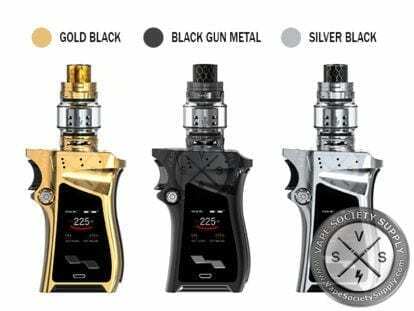 The SMOK Mag 225W and TFV12 Prince Full Kit is powerful and durable to own. It is the best vape! I will buy again and again and again!! It I beautiful and amazing. This is a good kit. Great but tank leaked even with new coil so will be staying with a different one but the nod is nice and heavy pretty smooth in the hand not bad. I absolutely LOVE the Smok Mag Kit!!! I upgraded from a "Smok Alien 220w" (Still works just worn out after two years of use/abuse). Smok really have out done them selves with the Smok mag. The look, feel and over all experience is GREAT! Easy to put together, much greater airflow and just the sheer tech upgrade is FAR superior to the Smok Alien! I received my order in just 3 days. The mod is working great!